Can the Irish pick up a tiny bit of momentum and win two road games in a row? The Notre Dame Fighting Irish men’s basketball team picked up a road ACC win last Saturday, taking down the Boston College Eagles in Chestnut Hill to extend their winning streak against BC and earn their second conference win of the year. Nik Djogo was especially great in just the 4th start of his career. Now, the Irish travel down south to Coral Gables tomorrow night to take on the Miami Hurricanes, who have been somehow worse than ND so far this year. Below are all the facts and figures you need to know about Miami and this Wednesday night match-up. The Hurricanes have had a rough 2018-2019 season, sitting 3 games below .500 overall and having lost 8 of their first 9 in ACC play. The non-conference slate was not kind to Miami, as the U lost to the Rutgers Scarlet Knights, Yale Bulldogs, and Penn Quakers in back-to-back-to-back games in late November and early December. Since ACC play kicked off, that general poor level of performance has been the standard for Miami, as the Hurricanes’ lone conference win came at home in an 11-point victory over the Wake Forest Demon Deacons. Notable, though, is that all of Miami’s losses in conference play have been to certain/likely NCAA tournament teams, as their first 9 games included games against the North Carolina State Wolfpack, Louisville Cardinals, North Carolina Tar Heels, Virginia Cavaliers, Virginia Tech Hokies, Syracuse Orange, and Florida State Seminoles (x2). For those of you scoring at home, that group of teams includes squads currently ranked 3rd, 8th, 11th, 16th, and 22nd in the country, with Syracuse and NC State receiving votes and having just dropped out of the Top 25, respectively. So, needless to say, Miami has been fruitlessly fighting against a gauntlet of every good team in the ACC, save Duke. They’re probably not quiiiite as bad as their record indicates. With all that said, though, they’re also certainly not good this year. They’re currently 93rd overall in KenPom (77th in offense, 130th in defense) and do NOT rank well in almost any significant statistical category. Offensively, they’re 168th in the nation in shooting (45%), 149th in scoring (74.5 ppg), 132nd in three point shooting (35.3%), 228th in assists (13 per game), 97th in free throws (73%), 263rd in offensive rebounding (9 per game), and 83rd in turnovers (12.2 per game). And on top of all that, Miami is 202nd in tempo according to KenPom, meaning they do NOT get up and down the floor or have enough possessions to make up for those shortcomings. Defensively, they have equally as poor showings in the stats, as they sit at 261st in the country in FG% allowed (45.1%), 195th in scoring defense (72 ppg), 188th in three point defense (34.3% allowed), 148th in turnovers forced (13.9 per game), 261st in defensive rebounding (just 24.3 per game), and 169th in blocks (3.4 bpg). Notre Dame isn’t a statistical dynamo themselves, but they have to feel decent about heading down south to take on a team like one that the above stats describe. The Hurricanes do have some talented individual players, though, and that crew is led by 5’7” sophomore point guard Chris Lykes. 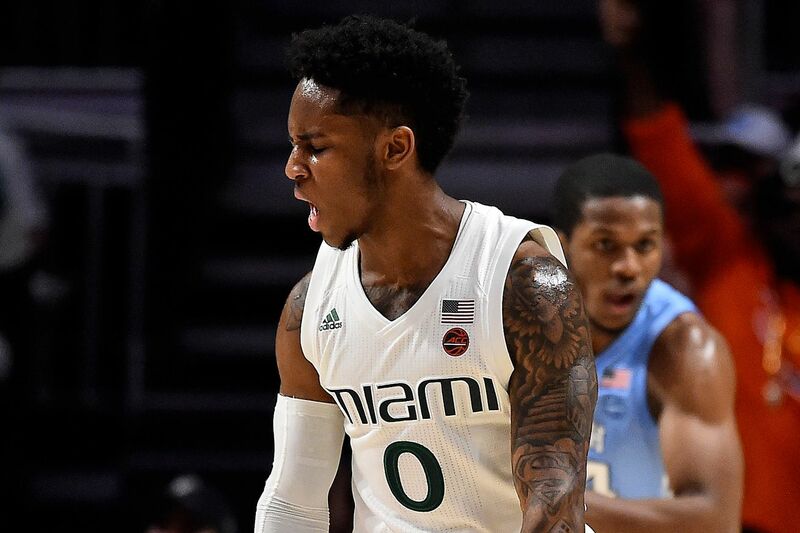 Lykes was a key reserve on last year’s tourney team, but as a sophomore he has become the leading scorer and distributor for Miami, putting up 16.7 points and 3.4 assists per game while also swiping 1.5 steals per contest and shooting 33% from deep. He’s a quick, electric playmaker who makes their offense go, without a doubt. Prentiss Hubb and T.J. Gibbs will really need to be ready to slide their feet and stick with him as he flies around the court. A pair of lengthy senior guards helps Lykes on the perimeter, as 6’2” Zach Johnson (13.3 ppg, 3.3 rpg, 2.2 apg, 1.6 spg, 33% 3FG) and 6’7” Anthony Lawrence II (11.7 ppg, 5.3 rpg, 2.7 apg, 1.3 spg, 0.9 bpg, 35% 3FG) are both decent shooters and able to finish at the rim. Add in 6’3” junior sharpshooter Dejan Vasilijevic (10.9 ppg, 4.2 rpg, 40% 3FG) and the Hurricanes have a handful of guys who can do some damage from the point/wing. Miami doesn’t have a ton of big man talent, but starting center Ebuka Izundu is pretty damn good on his own. He averages 11 points and 8.9 rebounds per game along with 1.4 blocks, and is very efficient, shooting 64% overall and even 33% from deep. Add in sophomore reserve forward Sam Waardenburg (6’10”, 5.7 ppg, 3.6 rpg), and those two along with Lawrence provide some height and rebounding ability. Overall, though, that’s really it for Miami in terms of key contributors. They don’t have a ton of depth and their best players are mostly perimeter guys. If Hubb, Gibbs, Dane Goodwin, and Nikola Djogo can play a little defense tomorrow evening, the Irish can definitely be in a position to win when it comes down to it. He’s their leading scorer and assist man, so the Hurricanes offense will only be as successful as he’s able to be. If he can get good penetration, beat his men off the dribble, and find a good balance of buckets at the rim and open shooters on the perimeter (especially Vasilijevic), Miami will have a VERY good chance to beat an Irish team that hasn’t exactly shown they can contain really good guard play this year. Hubb had a very good game against BC last weekend and his growing confidence is evident in how he’s playing. This will be a tall task for him tomorrow evening, though, as his former high school teammate Lykes is incredibly small and thus necessarily quick and crafty about how he handles the ball and gets his shots. Hubb HAS to bring his best defensive effort whenever ND is in man-to-man, and also needs to continue to get to the rim and knock down some threes so the Irish can keep the momentum rolling after Saturday. My brain is telling me not to pick the Irish on the road against a non-BC team, but with Juwan Durham back, and with the sudden confidence and aggression being shown by Hubb and Djogo, and with Gibbs finally hitting some shots, and with John Mooney continuing to just stack double-doubles, I think the Irish pull out another close one and improve to 3-7 in conference play. The Irish win this one 76-72. This article was originally published at http://OneFootDown.com (an SB Nation blog). If you are interested in sharing your website's content with SCACCHoops.com, Contact Us.